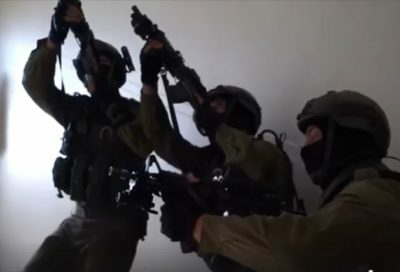 Israeli soldiers abducted, on Saturday at dawn, seven Palestinians, including the parents of the Palestinian who is believed to be behind the fatal shooting of two Israelis to death in an illegal colony in the West Bank, after the army invaded and searched dozens of homes. Media sources in Tulkarem said dozens of soldiers invaded several communities in the governorate, searched and ransacked many homes and abducted Waleed Suleiman Abu Sheikha (Na’alwa), Wafa’ Mahmoud Mahdawi, Ghassan Mahmoud Abdul-Rahman Mahdawi, and Khaled Hani Mosameh. They added that the soldiers also invaded and searched a store, owned by detainee Amjad Abu Sheikha, after smashing its doors and ransacked it. It is worth mentioning that Waleed and Wafa are the parents of Ashraf Na’alwa, while Amjad is his brother. Ashraf’s parents and many members of his family, relatives and friends, have been repeatedly abducted and interrogated by the army since the shooting, while some are still detained, and the army has informed the family of its intention to demolish their home. In addition, the soldiers abducted Nayef Raja from his home in the Rabay’a neighborhood, in Tulkarem refugee camp, while Essam Sharaqa, and his son Mo’taz, were abducted from their home in Anabta town, east of Tulkarem. The invasions on Saturday at dawn were carried out by dozens of military vehicle and soldiers, while the army extensively fired flares, gas bombs and concussion grenades, in addition to installing many roadblocks and searching surrounding lands and hills, in an attempt to local Ashraf.